Tuesday • January 12 • 2016 Volume 83• Number 02 bp Broadcaster Press INSIDE: Presorted Standard US Postage Paid Permit #8 ECRWSS Vermillion, SD n Menards	n Bomgaars n Employment	n Sears Postal Patron Local Since 1934 201 W. Cherry n Vermillion, SD 57069 n Phone: 605-624-4429 n Fax: 605-624-2696 n www.broadcasteronline.com Clay County Conservation District 2016 Handplant Order Form •Conservation grade stock, grown for winter hardiness in South Dakota •Discount on bare root deciduous bundles (25 of one kind) $50.00/bundle •Discount of bare root evergreen bundles (25 of one kind) $60.00/bundle •Substitution or refunds will be made on unavailable species •Payment (cash or check) must accompany order •Weather permitting; trees will be available for planting by mid-April Bare Root Shrubs $2.50 each ____American Plum - Native. Fast ____Hansen’s Hedge Rose – growing. Fragrant white flowers in spring. Edible fruit. ____Aronia - NRCS selection; “McKenzie” white flowers; glossy foliage; edible fruit attracts birds; excellent fall color. ____Chokecherry - Native. Will form colony. Produces white flowers and tart red to black fruit. Good for jelly or winemaking. Excellent for wildlife. Needs well-drained soils. ____Common Lilac – Fragrant flowers usually purple. Hardy and adaptable. Suckers to form colony. flowers subject to frost. Good all color. Won’t tolerate waterlogged soil. Produces edible fruit 2 out of 5 years. ____Amur Maple - Three lobed leaves. Usually forms several trunks. Excellent fall color. Prefers moist welldrained soil. Intolerant of high soil pH. Native in Eastern US. Fast growing tree produces white flowers and dark fruit. Fruit makes syrup and drinks. Attracts songbirds. ____Peking Cotoneaster – Lustrous green leaves and dark black berries. Excellent hedge plant. ____Black Walnut – Native in southeast ____Red Stemmed Dogwood – SD. Valuable lumber tree. Grows best in deep, moist soils. Attracts wildlife. Edible nuts. Native. Fast growing on cultivated sites. Red stems are attractive in winter. White flowers and fruit. Attracts songbirds. Excellent riparian plant. ____Bur Oak Native - Introduced. Tolerant to Emerald Ash Borer. Slower growing than green ash. Yellow fall color. ____Hackberry – Native. Extremely drought tolerant and adaptable. Very long-lived. Excellent shade tree. Produces purplish brown fruit, which are eaten by birds. ____Honeylocust – Native in SD. Tough and adaptable. May produce long brown seedpods. Fine lacey leaves. extremely tough, drought tolerant tree. Long-lived. Acorns provide wildlife food. Bare Root Evergreens $3.00 each Bundles of 25 - $60.00 ____Eastern Red Cedar – ____Ponderosa Pine – Fast Beautiful glossy green leaves. Tolerates moist soils. Not drought tolerant. Native. Very drought tolerant. Has reddish brown to purple winter coloration. Produces inedible blue fruit. Excellent wildlife plant. ____Red Splendor Crabapple – Flowers are white or pink. Leaves range from green to red dish. Fruit: ¼ to 1” in dia. Excellent wildlife tree. ____Black Hills Spruce - Native. State tree of SD. Very ornamental. Dense growth habit. Drought and alkaline tolerant. Cones attract song birds in winter. Bare Root Hardwoods – Sold in bundles of 25 $50.00/bundle growing once established. Drought tolerant. Intolerant of wet soils. ____Scotch Pine – Attractive peeling orange bark. Drought tolerant. Needles may temporarily turn yellow in winter. ____Austrian Pine – Stiff needles. Does not shed lower branches with age. ____Colorado Blue Spruce – ____Mongolian Cherry, ____American Black Current, ____Buffaloberry Needles may be blue or green. Very ornamental. Taller Bare Root Trees – Sold in bundles of 10 ____Laurel Leaf Willow 3-4, $75.00 ____Honeylocust 4-5, $80.00 Bare Root Tall Trees $2.50 each ____Black Cherry – ____Manchurian Ash – Fragrant pink flowers in June. Bright red-orange fruit in fall attracts wildlife. Bare Root Medium Trees $2.50 each ____Laurel Willow – ____Apricot – Pink 2016 Bare Root Specials ____Meyer Spruce: $3.00 each or 25 for $60.00 ____Honeoye Strawberries: 25 for $20.00 ____Little Leaf Linden 4-5, $80.0 ____Black Cherry 4-5, $80.00 FOR TREE AND SHRUB DESCRIPTIONS: www.ag.ndsu.edu/trees/handbook.htm The following selections need to be ordered early as quantities are limited. When they’re gone, they’re gone. Start your own native prairie garden and enjoy changing colors and wildlife through all four seasons. Native Grasses in #300 Pots $10.00/pot ____Big Bluestem ‘Bonilla’ ____Little Bluestem ‘Badlands’ ____Sideoats Grama ‘Pierre’ ____Prairie Dropseed ____Ricegrass ‘Indian Rimrock’ ____Buffalograss ‘Bowie’ Native Perennials in #300 Pots $10.00/pot ____Aster, Heath ____Aster, New England ____Aster, Smooth Blue ____Coneflower Purple ____Compass Plant ____Dotted Blazing Star ____Mexican Hat (Red) ____Purple Meadow Rue ____Rattlesnake Master ____White Sage ____Cardinal Flower ____Butterfly Milkwee ____Columbine, American ____Great Blue Lobelia ____Cup Plant ____Leadplant, Yucca ____Ironweed ____Joe Pye Weed ____Prairie Rose ____Culvers Root ____Anise Hyssop ____Prairie Lily ____Prairie Smoke ____Golden Alexanders ____Shell Leaf Penstemon ____Prairie Blue-eyed Grass ____Purple Prairie Clover ‘Bismarck’ ____Coneflower, Prairie ‘Up right Yellow’ ____Coneflower, Narrow Leaf ____Meadow Blazing Star ____Black-eyed Susan (Rubeckia) ____Wild Bergamot GRAPES Quantities are limited. When they’re gone, they’re gone. GRAPE VINES – They come in #300 pots and are $10.00/pot. 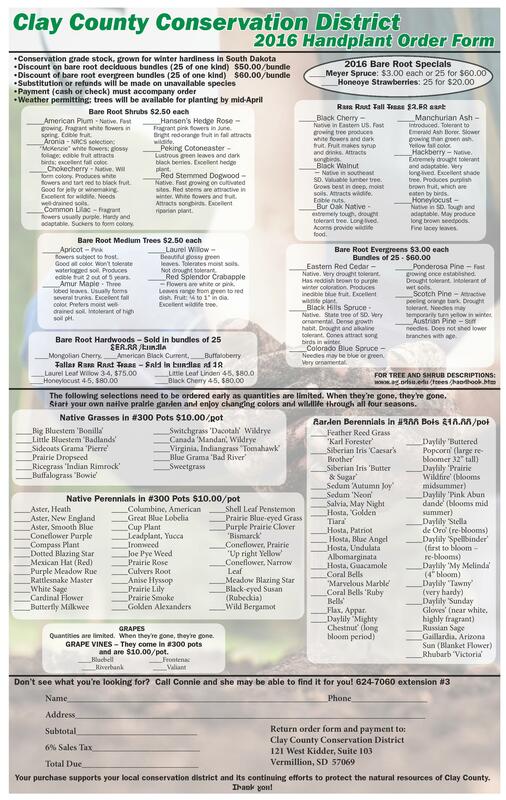 ____Bluebell ____Riverbank Garden Perennials in #300 Pots $10.00/pot ____Switchgrass ‘Dacotah’ Wildrye ____Canada ‘Mandan’, Wildrye ____Virginia, Indiangrass ‘Tomahawk’ ____Blue Grama ‘Bad River’ ____Sweetgrass ____Feather Reed Grass ‘Karl Forester’ ____Siberian Iris ‘Caesar’s Brother’ ____Siberian Iris ‘Butter & Sugar’ ____Sedum ‘Autumn Joy’ ____Sedum ‘Neon’ ____Salvia, May Night ____Hosta, ‘Golden Tiara’ ____Hosta, Patriot ____ Hosta, Blue Angel ____Hosta, Undulata Albomarginata ____Hosta, Guacamole ____Coral Bells ‘Marvelous Marble’ ____Coral Bells ‘Ruby Bells’ ____Flax, Appar. ____Daylily ‘Mighty Chestnut’ (long bloom period) ____Frontenac ____Valiant ____Daylily ‘Buttered Popcorn’ (large rebloomer 32” tall) ____Daylily ‘Prairie Wildfire’ (blooms midsummer) ____Daylily ‘Pink Abun dande’ (blooms mid summer) ____Daylily ‘Stella de Oro’ (re-blooms) ____Daylily ‘Spellbinder’ (first to bloom – re-blooms) ____Daylily ‘My Melinda’ (4” bloom) ____Daylily ‘Tawny’ (very hardy) ____Daylily ‘Sunday Gloves’ (near white, highly fragrant) ____Russian Sage ____Gaillardia, Arizona Sun (Blanket Flower) ____Rhubarb ‘Victoria’ Don’t see what you’re looking for? Call Connie and she may be able to find it for you! 624-7060 extension #3 Name__________________________________________________________Phone_________________ Address______________________________________________________________________________ Subtotal___________________________ 6% Sales Tax________________________ Total Due__________________________ Return order form and payment to: Clay County Conservation District 121 West Kidder, Suite 103 Vermillion, SD 57069 Your purchase supports your local conservation district and its continuing efforts to protect the natural resources of Clay County. Thank you! Home of Great Ideas since 1934 Come See What’s New at Hatch Furniture! Brand New Flooring Showroom Features Carpet, Wood Laminate, Tile & Vinyl All Furniture 50% Off or More! Excluding MSRP & Hot Buy Items 201 W Cherry St. • Vermillion, SD Phone: 624-4429 • Fax: 624-2696 BroadcasterOnline.com hatch FURNITURE Home Design Center Dan Orton, Store Manager and Flooring Specialist, brings 35 years of flooring and furniture experience to Hatch Furniture. 109 East Third, Yankton, SD 57078 • www.hatchfurniture.com 605.665.4416 • 800.798.4663 Monday-Friday 10-6, Saturday 10-5, Closed Sundays, Evenings by Appt.